From the time of colonisation to the 1950's, the flag for Dutch Guiana was the Dutch tricolour. Then, in the 1950's, the Dutch granted Dutch Guiana a degree of Self determination, which led to the creation of a flag for the nation. 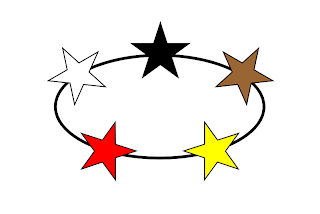 A simple black line ellipse linking together 5 stars of red, white, black, yellow, and brown. These stars where supposed to represent each of the various ethnic communities that make up the population of Dutch Guiana. The ellipse is supposed to highlight the unity of the peoples with the growth of the nation. 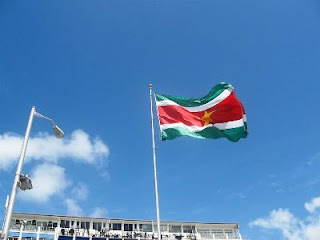 Then, in 1975, upon independence, the nation took the name of Suriname. The new flag consists of 2 green stripes top and bottom, representing hope and fertility, a central red stripe representing progress and love. 2 thin white stripes divide the red from the green, and represent peace. In the centre of the red stripe is a gold, 5 point star. This represents the unity of the 5 main ethnic groups.